Bolivian President-elect Evo Morales has arrived in Cuba on his first foreign trip since a sweeping election victory earlier this month. Mr Morales was warmly welcomed by Cuban President Fidel Castro, who said his poll win "had shaken the world". Mr Morales is set to become Bolivia's first indigenous president next month. An admirer of Mr Castro, he described his visit to see him as "a meeting between two generations of fighters for dignity and independence". 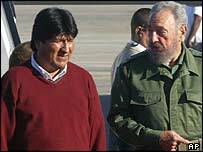 The Cuban leader laid on a ceremonial welcome for Mr Morales, sending his personal jet to bring him to Havana. Referring to the recent rise of left and centre-left politicians in Latin America, Mr Castro said: "It appears the map is changing, and we need to be reflective, to observe well and to be informed." An official Cuban government statement said Mr Morales' visit was "in keeping with the historic and profound relations of brotherhood and solidarity between the Bolivian and Cuban people". Mr Morales will also visit a number of other countries including Brazil, China and South Africa - but not the US - ahead of his inauguration next month. Earlier this week, Mr Morales gave an interview to the Arabic TV station al-Jazeera in which he accused President George Bush of practising terrorism in Iraq. He also said the White House had run a dirty campaign to try to stop him winning office. US officials have said they will judge Mr Morales by his actions, not his words. But correspondents say there is no doubt Washington is concerned about a politician who has described himself as a "nightmare for the US". Following his election earlier this month, Mr Morales said he would join what he called President Castro's anti-imperialist struggle. Mr Morales was elected president with nearly 54% of the vote, the biggest support for any candidate since democracy was restored in Bolivia in the 1980s.